The Missouri Women’s Golf Association is pleased to announce the Inaugural Mid Amateur Golf Championship, hosted by Payne Stewart Golf Club, a Troon course, in Branson, MO during July 25-27th, 2011. Golfers, volunteers, spotters and businesses are invited to participate in this event. Amateur women 25 years and older who are residents of Missouri or Johnson County, KS will compete for the first Missouri women’s Mid Amateur title in a 36 hole stroke play competition. Entries will be accepted through July 9, 2011. Volunteers are needed to spot golf balls or help with logistics. Local merchants are invited to submit marketing materials, token gifts and/or coupons for the Registrants’ package. Donations will be accepted to provide golfers with health-related essentials (e.g., water, sunscreen) and recognition will be in the event program. The local committee is encouraging golfers to bring their families and extend their visit to see all that the area has to offer. The Branson area is an excellent destination to play golf and enjoy the natural beauty, attractions, shows and shopping with family members. The MWGA promotes women’s golf in Missouri and its competitions are open to all amateur females in Missouri and Johnson County, Kansas. Through the support of MWGA’s members and friends, the Missouri Women’s Golf Education Association annually grants scholarships to deserving high school junior golfers in pursuit of higher education. Entry fee for contestants is $150.00. Membership in the MWGA is required at $30.00 annual dues. For those interested in golfing, visit the website for tournament entry forms and further details at www.mowomensga.org. We hope that you will be able to join us and participate in this unique event in some way. If you are interested or have any questions or require additional information, please call the Payne Stewart Pro Shop at 877 337-2963 or email mwgabranson@yahoo.com. Talent On Parade, a national touring dance competition system, presents Kidz Roc, a full length theatrical production making its debut in Branson, Missouri. This unique show will include 40 of the “best of the best” competition dancers from 13 surrounding states who will be involved in TOP Go Pro, a pre-professional summer workshop also hosted by Talent On Parade. The goal of the TOP Go Pro workshop is to assist dancers as they make the transition to a professional dance career. Kidz Roc is the culmination of that workshop. The star and host of the show is professional singer/dancer Kim Alvarez. The show will also include a special guest appearance by the up and coming rock band Armonia. Kidz Roc will appear at the Clay Cooper Theatre 2 days only, July 23-24 with shows at 1 and 4 pm each day. Kidz Roc has been written and produced by Doucette Entertainment of Las Vegas, Nevada, an international player in the show production industry. Doucette Entertainment partner Don Mirault has worked in the dance competition industry for more than 20 years and is excited to assist in putting Kidz Roc on the stage. “We have always wanted competition dancers to have a professional outlet for the hard work they’ve put in, and this is finally that opportunity”, said Don. The show will include dancers ranging in age from 10 to 20 years old. This full scale production will also include all the things kids love in a show like lights, smoke, live camera footage, MTV style video, rocking music, and amazing dancing. Those interested in attending the show can purchase tickets from the Clay Cooper Theater by calling 417-332-2529 or toll free 877-317-2604. Tickets can also be obtained directly from the Clay Cooper Theater box office at 3216 W. Highway 76 in Branson (across from the Titanic Museum). 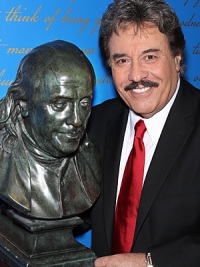 NEW YORK – June 16, 2011 – Tony Orlando, one of the most beloved and iconic American Entertainers for the past 50 years, has joined forces as a Partner and Vice Chairman with The Franklin Mint, the most trusted brand in the world for Gifts, Heirlooms and Personalized Collectibles. “No one speaks to America with more passion and credibility than Tony Orlando. He brings a product development and marketing sensibility crafted through his accomplishments. Tony will lead The Franklin Mint’s vigorous efforts to embrace new branding in film, television and music, incorporating all digital and traditional platforms. We are honored to welcome Tony to The Franklin Mint as our Partner, and to our Leadership Team,” said Mr. Robert H. Book, Chairman of the Franklin Mint. Orlando has also been set for a major role in the next Adam Sandler movie, I HATE YOU DAD!. The film is currently shooting in Cape Cod. Under Tony Orlando’s leadership The Franklin Mint is planning to introduce the Yellow Ribbon Medal of Freedom, Wounded Warrior Sculpture, the Yellow Ribbon of Freedom Sculpture and several more products that honor the men and women of the United States military. An American icon, The Franklin Mint was founded in 1964 and is known worldwide for its innovative design, meticulous attention to detail and creation of the highest-quality gifts, heirlooms, and collectibles in the world. The Franklin Mint’s peerless archives contain over 12,000 products, including Limited Edition ﬁne art sculptures, heirloom dolls, ﬁne commemorative coins, designer jewelry, precision die-cast models and historic reproductions.